With the previous day’s fiasco behind me, I spent the first day sorting out the route to the south, reorganizing my freshly formatted phone and preparing my laptop for a reformat – digital baggage I should have managed before leaving Toronto. It took a few hours of sitting in front of a screen and listening to the bustle and honking of traffic to make my restlessness bubble over. My new mission to find a market and get food led me through a small maze of busy streets in Panscheel Park but to no avail. The hostel luckily had a binder of leaflets from local restaurants that deliver to appease my growing appetite for my first authentic Indian meal. For about 245RS/$5CAD the deceivingly generous “half-size” serving of butter chicken and naan arrived – about a 1L bucket of sauce and chicken. The struggle was absolutely real to get a proper ratio between the sauce and naan. It was while I was ingloriously stuffing my face that I struck a conversation with a lovely and bubbly yogi named Yarang, who was passing through the kitchen looking for a cold drink of water. We exchanged pleasantries and engaged in a brief chat until she pointed out my error. With the little strip of naan I had left, she took a piece, pinched the center edge and curled it in such a way that it formed what looked like a tiny sturdy cone. Turns out I’ve been eating Indian food like a savage with the flimsy scoop I’ve been making all these years and it explains why some waiters ask if my excessive order of naan wasn’t a mistake. Overconfident with this new naan curling skill, I continued to struggle with the rest of my meal. By the time I was stuffed and all out of naan, a half bucket of sauce remained which I reluctantly discarded knowing there are people starving just a stone’s throw away from the hostel. We bumped into each other a few times over the evening and I eventually joined her and another hostel patron when her order of thali arrived. With fresh naan, she made a properly sized scoop larger than what my remaining strip could afford, “See, like this!”. As she ate her meal, the conversation turned to her ethnicity. Although she had the appearance of being east-Asian, she hails from the tribal village Ziro in the eastern Indian region surrounded by Bhutan, China and Myanmar. She was headed south to Kerala for additional yoga training but was passing through New Delhi to meet up with a friend the next day. By the following morning, her friend had to cancel and Yarang offered to show me around Hauz Khas in the afternoon. I planned to visit this area and she just happened to previously live nearby a few years ago. But first things first, we ventured off into the same maze of streets where I was partly lost and settled in a family restaurant for lunch. She ordered vegetable thalis for us, mine being a “special” version. In her region in India, simpler and less complex flavours are preferred and this was evident in the richer spices in the special thali I was savouring. Their region is also more reliant on meat in comparison to India’s larger vegetarian demographic as greens are not as abundant in the higher altitudes (I’m pretty sure we discussed this unless I’m mixing it up with another conversation at which point, I apologize and will edit accordingly). As the afternoon approached, she hailed a rickshaw, to make our way to Hauz Khaz, whose driver gave us a good laugh assuming Yarang was my wife. Nevermind a courting couple, we were elevated straight into married status. Translated to “Royal Water Tank” in Urdu, Hauz Khaz consists of contemporary amenities surrounding the historical park with a water reservoir in its center. Back in her familiar stomping grounds, I followed Yarang like a lost puppy through narrow and tall alleys of modern shops, restaurants, bars and galleries. As most establishments were closing to get ready for their evening service, we wandered past the complex into Deer Park through the tombs and remnants of the fort. An unexplored discovery for me while a nostalgic romp for her, we sat atop the edge of a nook in the fort’s wall, an opening she used to climb up to in years past, and watched the flow of people walking around the pale green reservoir as corvids, eagles, pigeons and the odd parrot hovered in the sky. Our stroll led us through the deer enclosures where herds of spotted deer wandered alongside peacocks exercising their freedom of flight, hopping and gliding above the enclosure fences. The typical image of a peacock with its tail fanned out doesn’t quite compare to the majestic silhouette of these birds in mid-flight and I feel as if this is the closest manifestation of a phoenix we’ll ever experience. As the patches of gnats grew thick around the tank, we headed towards a short tower and sat on the roof watching bats leaving their roost and flying overhead as twilight faded into dusk. Continuing forward on the same path around the tank lead back to where we entered. The dim lighting in an unassuming alleyway that caught my eye when we first arrived is now a beacon drawing me to its direction. An undiscovered area for Yarang, it was a pleasant surprise revealing small and quaint shops, galleries and a hidden mural spanning across three facades. Winding around and snaking through the buildings, the alley eventually led back to the main street where the bright lights and neon signs of the complex have transformed the previously quiet neighbourhood. The hawkers were also starting to get into the swing of things convincing the closest passerby to spend their rupees on their wares or establishment. Walking down another alley, I settled us into what seemed like the only bar that did not have someone hawking their drink specials. It was almost empty but had life. The live band whose sound check we enjoyed over a refreshing drink was a welcome contrast to the blaring club music of the other bars. We eventually left the comfort of the air-conditioned dining area to the patio where we watched the moonrise glow through the hazy Delhi night sky, mostly in conversation about where we are in our lives and sometimes just gazing out in comforting silence. Time unfortunately flies by with good company and we called it a night as the patio soon filled with rowdier patrons getting their drink on, the view of the rising moon replaced with bobbing heads and unapproved stares. A pair of kulfis and a rickshaw ride later, we were back to the hostel. We spent the rest of the night on the rooftop, with me watching the feats of strength between her and an acrobat challenging each other to perform vertical handstands and yoga poses meant for pretzels. The inevitable came following day as we parted ways. She was catching a flight to Kerala and I was staying in Delhi for a few more days. She introduced me to another traveller in our room and I decided to tag along his group. Before heading out, I caught Yarang one last time. I truly felt we had a genuine connection and considered her my first friend in India. It only seemed proper that I present a token from Canada – a small bottle of sweet maple syrup (don’t ask why I’m carrying maple syrup). I guess I caught her off guard with the gift and gave me one in return. Describing it as something given to (or perhaps, by?) grandmothers, she presented to me a japa mala – a string of prayer beads. Similar to a Christian rosary, starting next to the head or guru bead, one recites prayers on each of the 108 beads until the end of the full rotation. However, unlike the rosary, instead of continuing to the guru bead, you turn back and complete the rotation in reverse. I suppose both tokens are good for the soul in their own way. With that, a final hug and goodbye as I walked out the room with the hope to run into her again. New Delhi is simply a beast. Travel research will only soften the blow once you’re in the thick of things and the currency exchange counter at the airport welcomes you to this fact. I needed a little cash to cover a taxi ride to the hostel and approached the counter reluctantly. I was quoted a low rate, which I expect from anything running out of an airport, but no sooner after handing over $70USD that the quoted amount was chipped away by a mountain of nonsensical surcharges indicative of practically every purchase moving forward. This city was ready to eat me alive right from the start. As misfortune would have it, upon my arrival at the hostel, all the distractions during my preparations caught up to me. I inadvertently booked my check-in date as my departure date from Toronto rather than my arrival date in New Delhi. Since I was a no-show the day prior, the hostel forfeited the entire reservation. By the time I sat down to check-in they were fully booked and at 11PM I had nowhere to stay with no one to blame but myself. After riding in an overpriced taxi, all I wanted to do was put my head down somewhere and accept temporary defeat before getting my bearings together. With a little bit of coaxing, the hostel receptionist was sympathetic to my situation and allowed me to sleep in the common area, for a lower rate with access to all amenities, which I gladly accepted. Despite the rough start, this gesture of hospitality was a reassuring sign of things to come. The plan is to slowly settle in to New Delhi and orient myself to the new surroundings and culture in a week’s time. Over the next few days, I met three kind souls that welcomed me to the belly of this beast. Almost forgot I still have this site until the auto-renewal popped up in my inbox. Actually, wait. That’s a lie I’ve told myself for the past two years each time it renewed. To be honest, my good intentions of editing and perfecting the notes, photos and videos I took almost two years ago were left as just that: intentions. And a whole pile of unfinished work. An awesome dude I had the pleasure of travelling with in Peru told me to just write, publish and not to worry about the mistakes. Jack, I should have listened. Now, without making any promises, I’ll try to play catch up. I owe it to several people I met along the way to share my part of the shared experience. In the meantime time, to prep for YYZ > DEL. 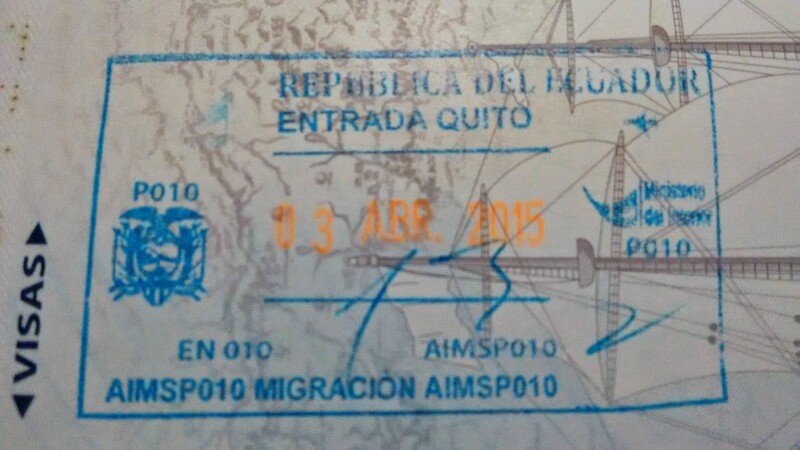 Timing was on my side by arriving in Ecuador on Easter. I got a chance to eat Fanesca which is served only once a year on Good Friday. It’s a rich squash based soup with twelve kinds of beans served with a multitude of toppings. However, what I found most special about this meal is not so much that it’s only served and consumed annually, but how it was prepared by four different households. Yes, that’s right, it took four families to cook it! 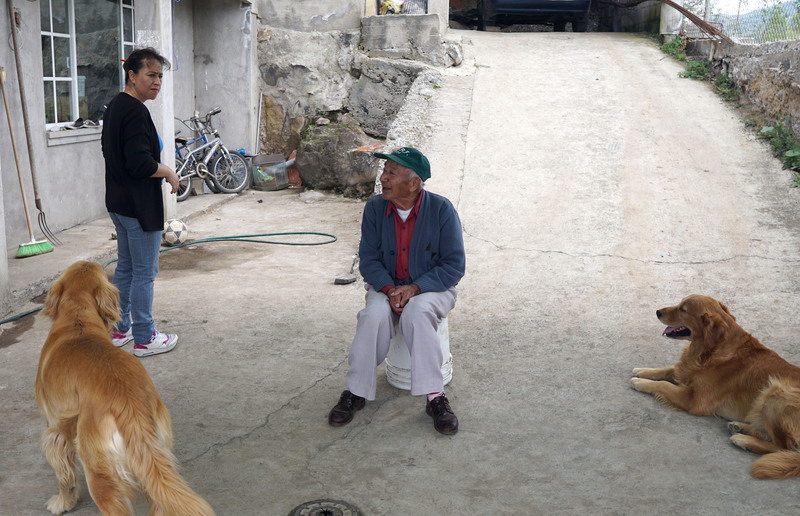 The families are all related through the four sisters whose houses are staggered slightly above each other on a plot of land in the hilly area of Ibarra. Prep work was done between the two houses near the top of the hill with ingredients being carried between each other to be cooked. One kitchen was full of people chopping up squash and separating beans, while the dining room table had kids helping out the adults chop some colourful vegetables while separating more beans and rice. 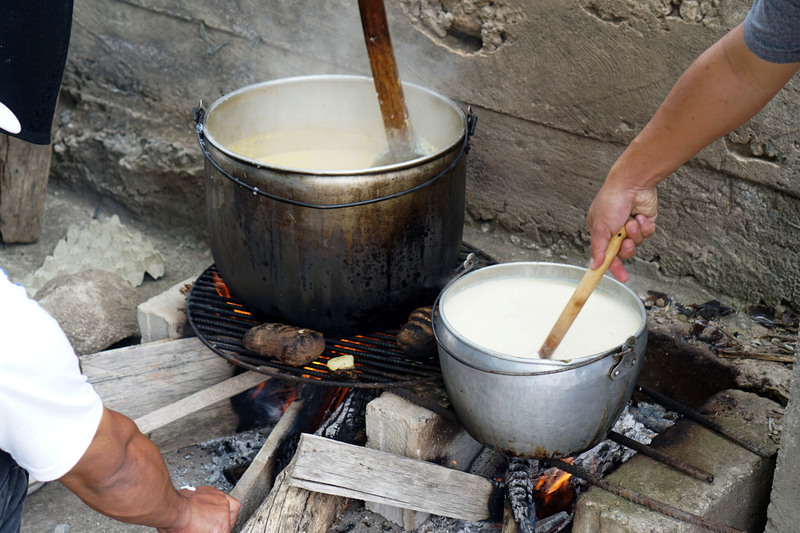 When I entered the kitchen in the other house, I was met with the aroma of food being boiled and fried on the small gas stove. While savouring the scent and gazing out into the mountainous backdrop, Julio and I were handed a knife, chopping board, plantains and was motioned to chop them into slices. Hooray, I contributed! Meanwhile, out on the laneway was a makeshift fire pit of bricks, grills and some rebar where two pots were heating up with the firewood I helped gather earlier in the morning. 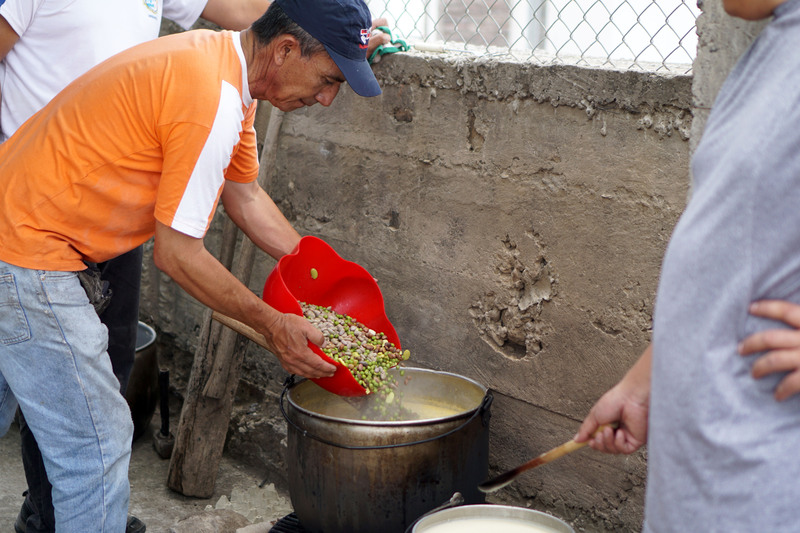 Ingredients were added to the gigantic pot which slowly reduced to the soup while the smaller pot was slowly boiling milk, rice and cinnamon for dessert. Kids, adults and even the dogs would pass by under the tarp every so often being drawn in by the amazing smell of the soup as it came together. Once everything was ready, extra tables and chairs were brought in from all the other houses to setup the dining room – one table for the adults and one for the kids where I was seated. After all families were gathered around, a blessing in Spanish and the Lord’s prayer were recited before enjoying the delicious meal where everyone was lost in conversation and laughter that I could not understand, only picking out a few words I’m familiar with. At one point, it was explained to me that the mixing of twelve beans had a religious significance, possibly with the twelve apostles of Jesus. However, the whole process took on a different meaning to me. 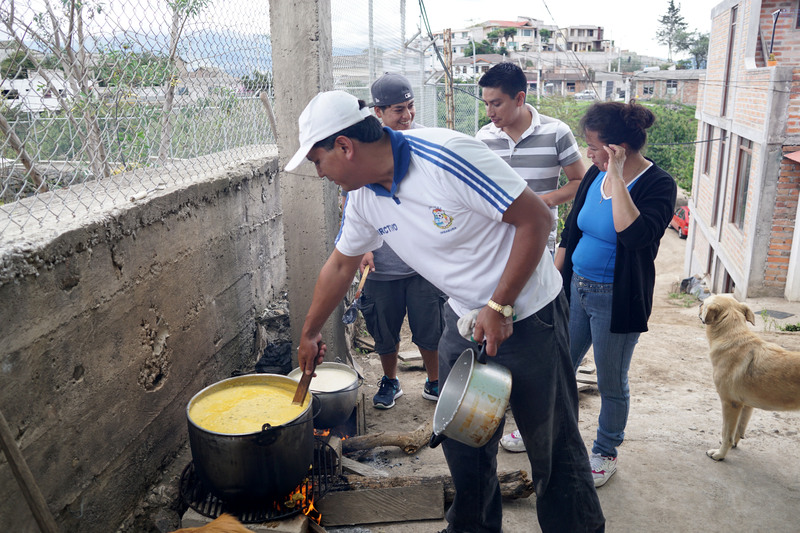 The laborious cooking of Fanesca, represented the togetherness and bond between the families through their efforts to make a great holiday meal. Just the typical surroundings in Ibarra. Stiring the pots, adjusting the flames. Adding the beans. Yes, it was very beany if you know what I mean. Final check and almost ready. 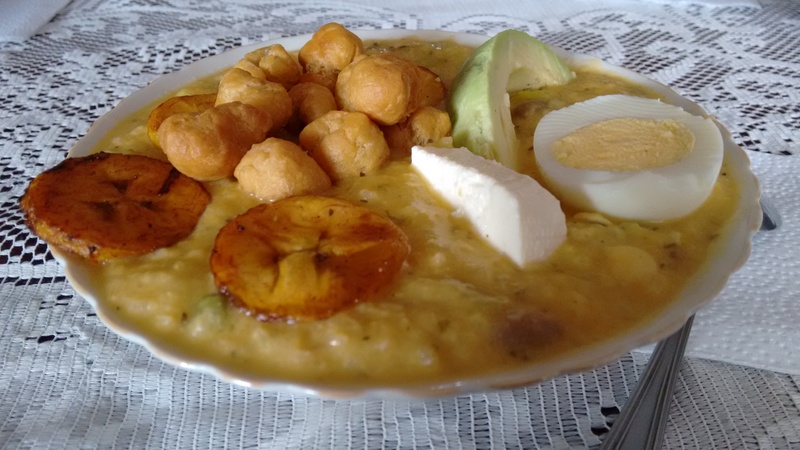 The Fanesca was served with fried plantains, fried dough balls, a slice of avocado, cheese, a hard boiled egg and some salted fish boiled in milk as toppings, finished off with Arroz de Leche for dessert. 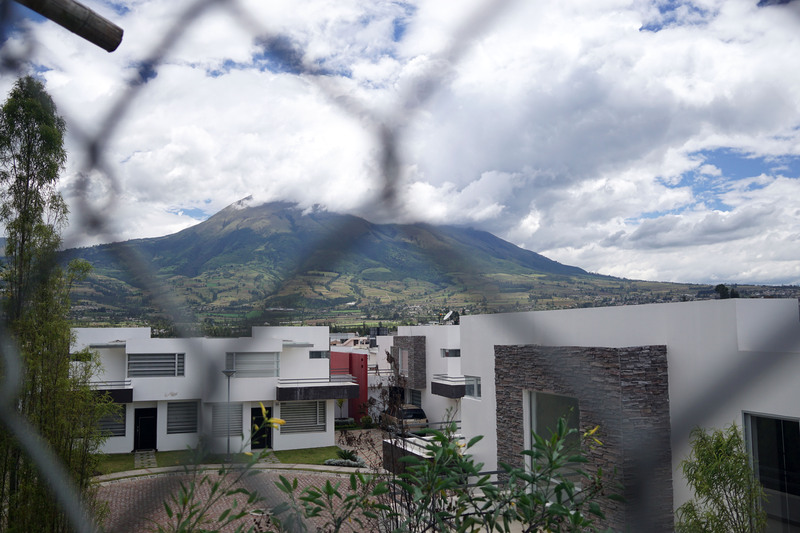 After several sleepless nights of packing, I’ve finally arrived in Ecuador after a short stopover in El Salvador. Julio and Gabby picked me up from the recently built Aeropuerto Internacional Mariscal Sucre then headed off to his house in Ibarra through the winding mountain roads for a good night’s rest. After some short catching up in the morning, I’m now helping their family and friends prepare their traditional Easter feast with my non-existing and broken Spanish.